(Newser) – The Russian delegation at the Pyeongchang Olympics has announced that one of its athletes has failed a drug test, reports the AP. Two Russian state news agencies cited Konstantin Vybornov, spokesman for the "Olympic Athletes from Russia" team, as saying the delegation received an official notification from the International Olympic Committee of the positive test. Vybornov said a "B'' sample taken from the athlete will be analyzed within 24 hours, but did not name the athlete or the sport involved. A confirmed doping case could be an obstacle to Russia's efforts to have the Russian team formally reinstated in time for the closing ceremony. "Doping testing and sanctioning at the Pyeongchang 2018 is independent from the IOC. Therefore, the IOC cannot communicate on individual cases while the procedure is still ongoing," the IOC said in a statement. 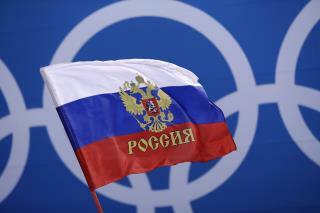 Why were the athletes allowed to compete after Russia was banned? It's a purely symbolic ban, and serves as no deterrent at all. The entire Russian team is doped. This whole thing is a joke. Russia/USSR has been doping heavily as a state sponsored.... _Required_ program for many decades. https://www.yahoo.com/news/putin-seethes-olympic-ban-doping-whistleblower-fears-life-100019751.html Eastern Block women who look like men after years of steroid use are an open joke. A day ago or so Newser ran a story about a Brit olympian who was "sent home in disgrace" for failing to show a hotel security guard his I.D. and they named his name. A Russian athlete gets caught doping and is not named and while sent home it lacked the qualifier 'in disgrace.' Whiskey Tango Foxtrot?